A massive thank you to the fabulous Dee Cowell for her demonstration at Kennaway house. What a delight to the senses it was. The demo started by splashing vivid yellows, reds and rose pink watercolours onto a canvas (yup you heard it ...A canvas!) which was prepared with acrylic modelling paste. 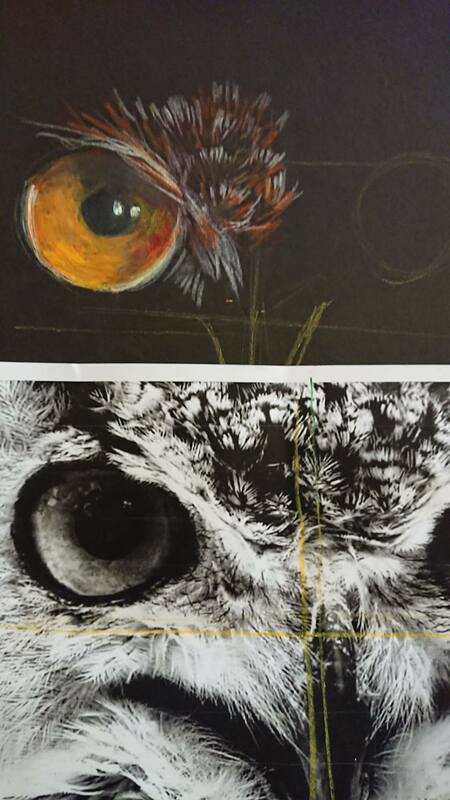 Then she set it aside to dry whilst she entertained the group with wonderful tales and an owl eye & lions fur demonstration using Inktense pencils and black paper from the 'Derwent Black Book'. Later she started a porpoise painting by analysing a pre-prepared blue loose canvas background for shapes hidden in the paint ... (a bit like cloud gazing) ... which she then teased out with painting both negative and positive shapes allowing the creatures to develop organically. Map the darker colours and patterns of fur/feathers/ texture first ...underpin your work with a good drawing ....then set yourself free. Derwent sword brush is a wonderful brush for expressive sweeps of colour and delicate lines. Ray gave his usual comedic critique on the members work and although the evening was somewhat poorly attended he still did not manage to get through all the painting brought along. He likes to have a chat to everyone. However I am sure all those that did receive his word of wisdom and those watching all enjoyed themselves at what turned out to be a most entertaining evening. Ray left by tell us that he is to hold, along with five other artists an exhibition of works at Darts Farm from the 1st - 3rd June all are welcome and entry is free. This month Gregory Wellman, a local artist, born in Lyme Regis, now living in Tiverton, presented us with a very large painting of a bull elephant he had photographed while on Safari in Tanzania. Gregory belongs to "Artists for Conservation" a Canadian Society which promotes conservation through art. He surprised us with a very red background on MDF. 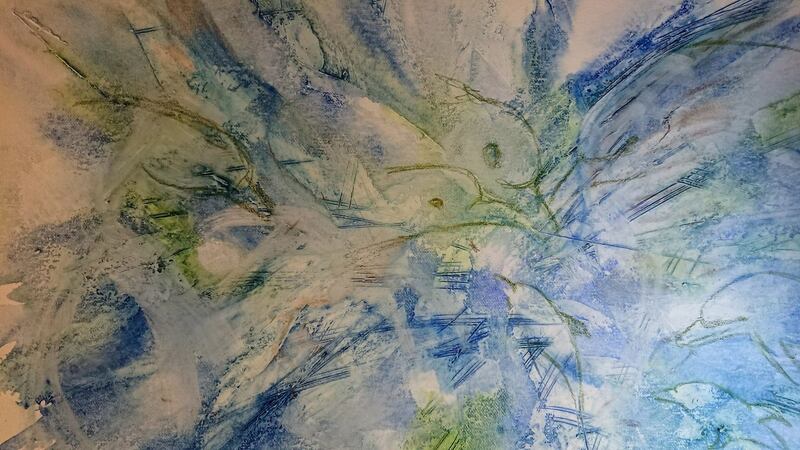 He prefers MDF to canvas as one can scrub into the surface firmly with the brush whereas canvas tends to give. He sketches the outline with the paint onto the background. He uses low cost acrylic paints and a variety of reasonably large brushes one could buy from DIY. Gregory explained and then demonstrated that the red would give warmth to the painting as the elephant was from Tanzania but would not be the final background. He works from dark to light with some tonal work to start. He insists that tone is more important than actual colour. He enjoys painting without too much uniformity with an impressionistic approach and gave us to understand that the painting would not be finished but that we would have some idea where the painting was going when he had finished. This was an interesting demonstration with numerous very useful tips. We were all waiting for the red to recede which became evident the last few moments of the demonstration! On a bitterly cold night Lynda Kettle, Chairperson for the Society, gave a most informative demonstration of a Spring Scene using pastel paints. 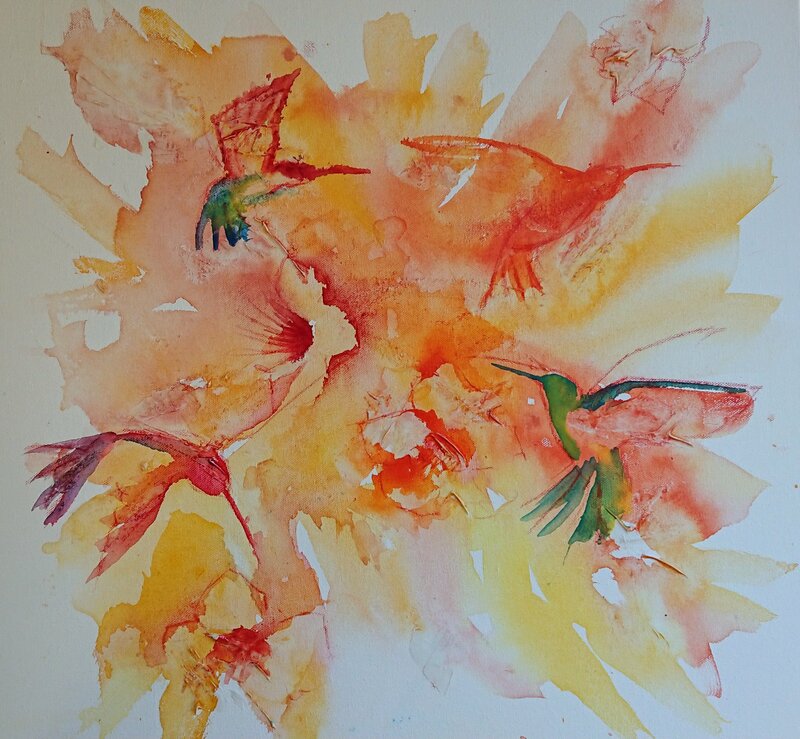 Lynda trained in London and originally worked as a designer for theatre and television, after which she continued her career in Art, painting, giving demonstrations and workshops. 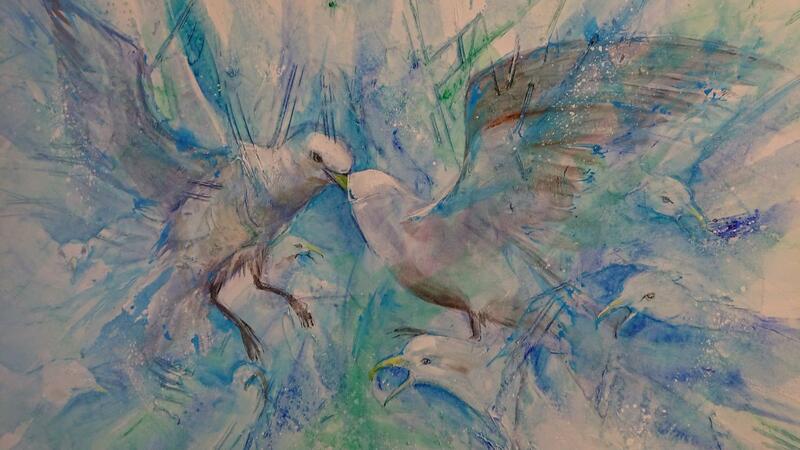 She has practiced pastel painting for 20 years but is also proficient with all other forms of Art Medium. The demonstration was carried out on Fisher 400 paper her preference for this type of paper was its strong tooth, somewhat like sandpaper. This allows the paint to stick to it, and although expensive will give a better result. She used Unison pastel sticks as they are soft and easy to use. Starting her work at the top she progressed to the bottom of the paper working from light colour to dark. However she also demonstrated that lighter colours can be used on top of dark as the tooth of the paper holds the paint. Throughout the demonstration Lynda gave us some very useful information and tips finishing off with a few notes on the best way to mount a pastel painting prior to framing which was much appreciated. This was a very enjoyable evening, worth venturing out in the bitter weather. Lynda likes to work quickly, and had prepared well, so the picture was finished in record time the final result was quite special speaking for itself. The January demonstration was given by Trevor Waugh. 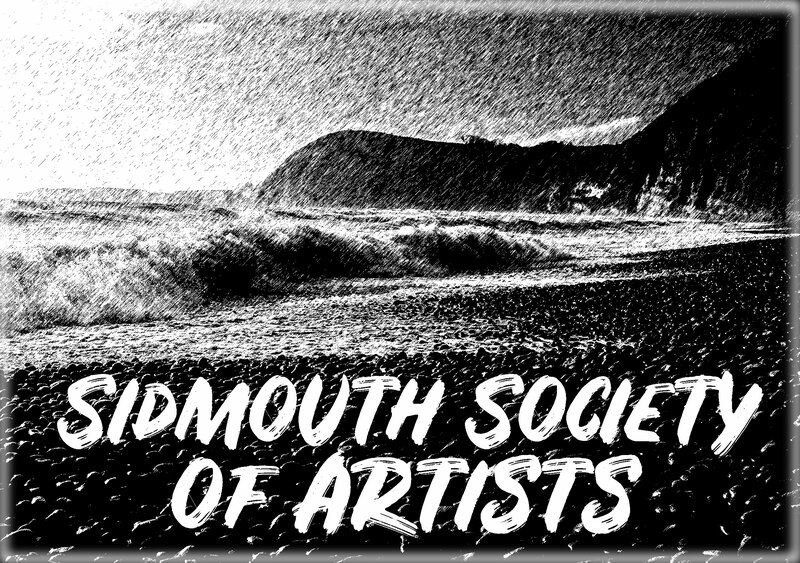 On his return to Sidmouth this fine artist from Wiltshire, treated us to a most inspirational evening. He chose to paint Roses using watercolour medium. 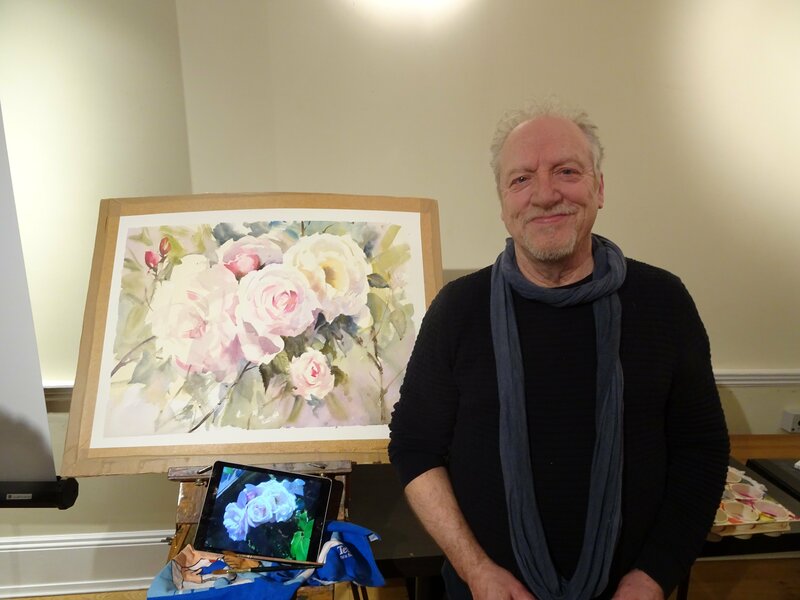 He has studied and painted flowers for years and loves them. He emphasized the importance of studying flowers in their natural habitat, to allow more insight when painting, and when painting to be more expressive and allow personal instincts to take over to enhance the work. 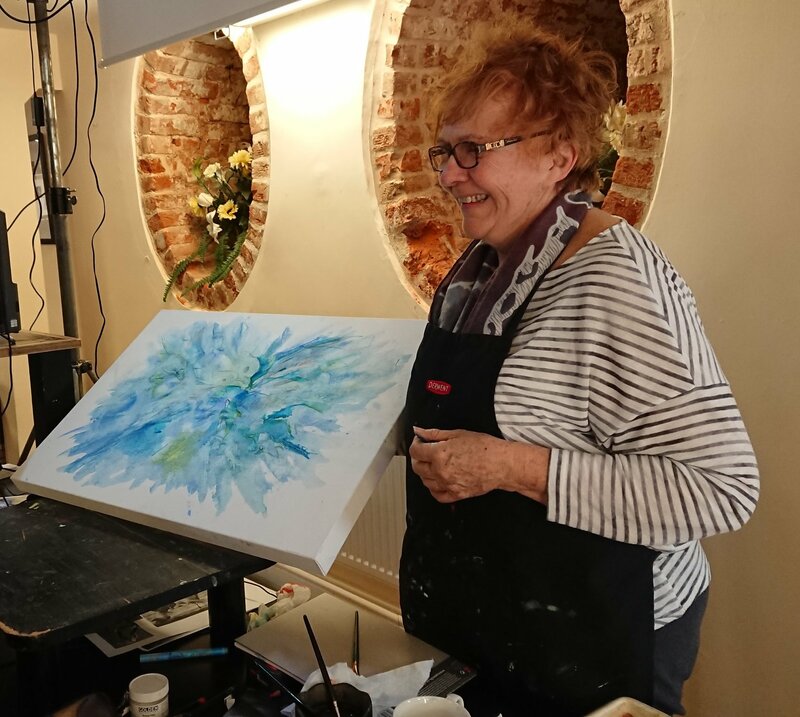 Trevor demonstrated this brilliantly during the evening, from the first pale wash to allowing the flowers to unfold from the centre out using only brushwork. He never draws a pencil outline but paints straight onto the paper -"Shanloose" is a layman`s term for this type of painting dispensing with the outline. The Roses did indeed unfold as Trevor painted whilst teaching us once again how to use "wet on wet " and the beauty of painting loosely. This is one demonstration we will not forget and left many of us feeling we wanted to adopt this style which Trevor made look so easy. I wonder? It was no surprise to hear that Kew Gardens have commissioned Trevor to illustrate a book for them. We look forward to seeing that.